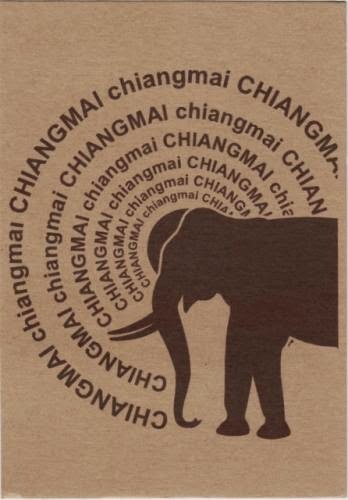 Postcard TH-191063 from Thailand shows an elephant with texts of "Chiang Mai" forming as in circles as rays from the sun. Located 700 kilometers or 435 miles north of Bangkok, Chiang Mai is the largest and most culturally significant city in Northern Thailand. Surrounded by the highest mountains in the country, the city sits astride the Ping River, a major tributary of the Chao Phraya River. The location helped Chiang Mai to gain historic importance due to its close proximity to major trading routes associated with the river. Today marks the first day of the Songkran festival (潑水節) that is celebrated in Thailand as the traditional New Year. The festival lasts from April 13 to April 15. It coincides with the New Year of the Buddhist and Hindu solar calendar used in South and Southeast Asia. The traditional water pouring during the festival symbolizes a ritual of washing away all of the past evils and sins.